One of my many new year’s resolution for 2018 is to eat out less – this is a hard one honestly but I am determined to make it happen. I want to share more healthy recipes throughout this year and am hoping to support more local farms & produce. I wrote about Fresh City Farm‘s towards the end of last year, if you’ve missed it – I’ve attached a link to that blog post that will give you a better idea of who they are and what they offer. I’m a huge supporter of fresh organic produces from local farms and am sharing one of my favourite recipes from Fresh City Farms. 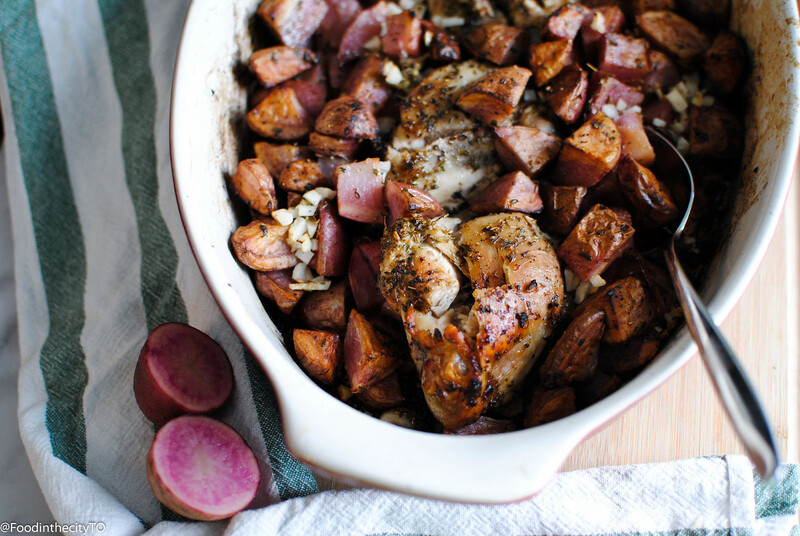 Roast the Chicken & Potatoes • Preheat the oven to 425ºF. Dice the potatoes into 1-inch cubes. Add them to a large bowl with the chicken thighs. Toss with 2 tbsp. olive oil, Greek Spice Mix, and salt and pepper to taste. 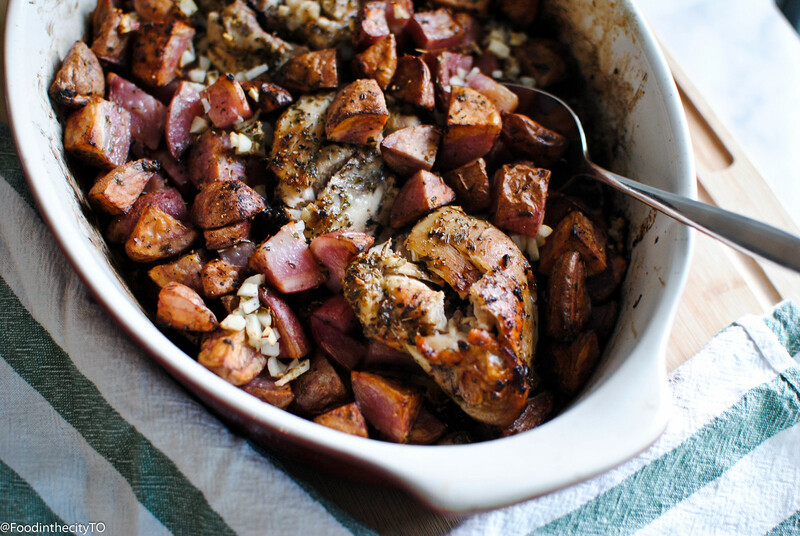 Pour the chicken and potatoes into a large baking dish and place it in the oven. Bake for 30 minutes. Make the Greek Lemon Sauce • While the chicken and potatoes are roasting, cut the lemon in half and squeeze the juice into a small bowl, removing any seeds. Mince the garlic and add half to the bowl. Add the oregano and whisk with a fork to combine. Marinate the Chicken • After 30 minutes, remove the chicken and potatoes from the oven and pour the Greek lemon sauce over top. 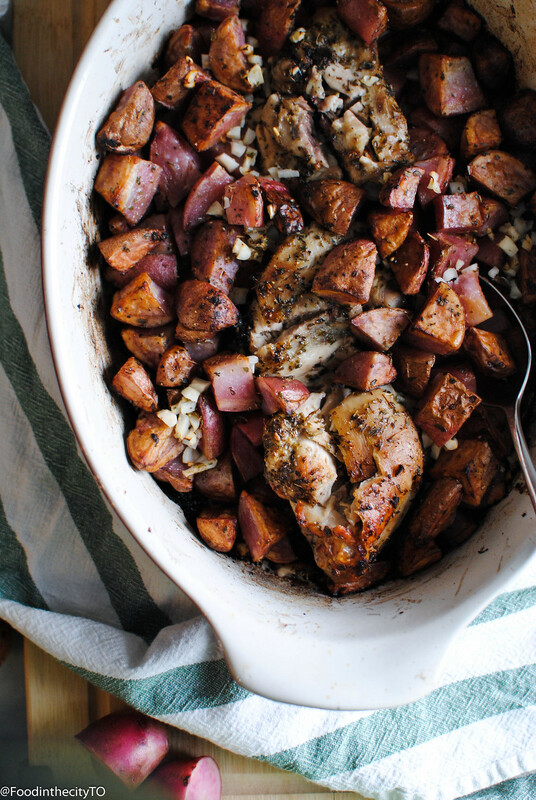 Return to the oven and bake until the chicken is cooked through and the potatoes are fork-tender, about 10-15 minutes. The chicken is done when it reaches an internal temperature reaches 165ºF and shows no signs of pink. Wilt the Greens • In the meantime, rinse and dry the leafy greens and roughly chop them. Heat 1 tbsp. olive oil in a small pan over medium heat. Add the greens and remaining garlic, and cook until the greens are lightly wilted, about 2-3 minutes.